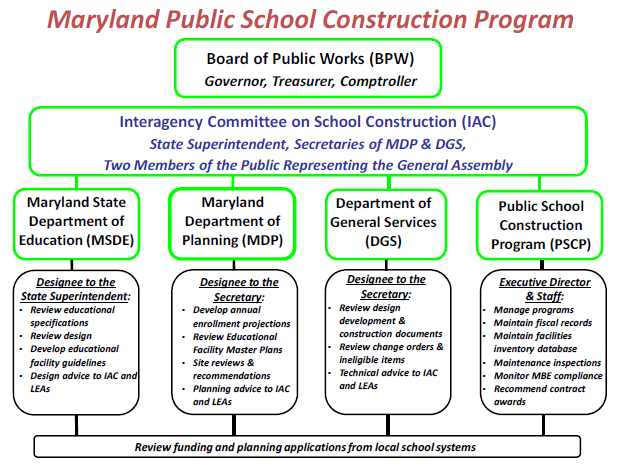 The Maryland Department of Planning plays a vital role in the PCSP. The department assesses enrollment projections, sites, state-rated site capacities, and the relationship of requested projects to the Local Educational Facilities Master Plans and comprehensive plans. First and foremost, public schools are community institutions of learning, but as public facilities they have a significant impact on local land use, transportation needs, and community development. As large facilities, they require utility extensions and consideration of environmental and other constraints, and have high operating costs. With hundreds, and sometimes thousands of students, faculty, and parents coming and going each day, public schools also greatly affect local road and pedestrian networks. And if situated in a more established neighborhood or community core, school construction and rehabilitation can spur economic activity, promote revitalization, and develop community anchor institutions. Planners speak this language. As such, Planning staff contributes expertise in smart growth, Priority Funding Areas, Sustainable Communities, and comprehensive planning. The IAC meets six times a year, and Planning staff is always on hand to continue the hard work of ensuring the best possible educational learning environments for Maryland’s youth. Like planning, education is a multifaceted and complex endeavor that integrates the personal and human with the physical and technological. If there is a responsibility requiring the attention of as many state agencies as possible, it is public education. And while some PSCP funding requests may go unrewarded in a fiscal year, the IAC recognizes their significance and looks forward to considering them again the following year. Planning is honored to be part of this team and to advance this mission. For more information, consult the Maryland Public School Construction Capital Improvement Program for fiscal year 2018.